Whether you know the song "The Log Driver's Waltz" from the National Film Board short (John Weldon, 1979) or the version by the group Mountain City Four (with vocals by Kate and Anna McGarrigle) that accompanied the Canada Vignettes animated film, The Log Driver's Waltz is a piece of Canadiana which all will recognize. 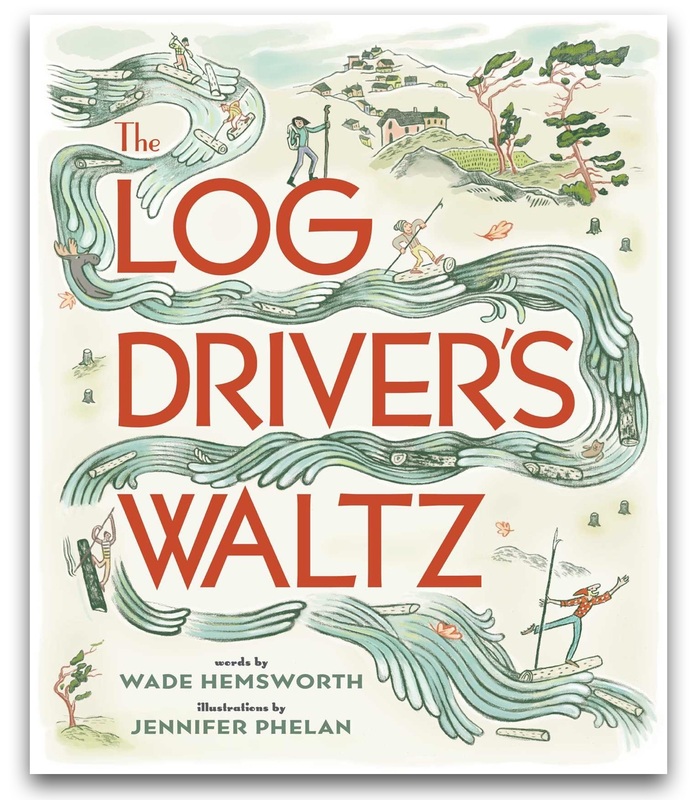 Written by folk singer-songwriter Wade Hemsworth of the agile log drivers he observed while he worked as a surveyor in remote areas of Canada, The Log Driver's Waltz is an iconic folk song of work and play and love in a northern landscape of trees and water. 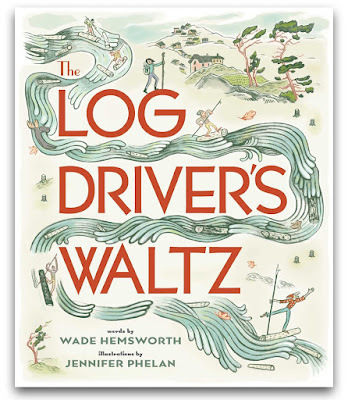 Wade Hemsworth's lyrics may take readers and music listeners to a time when log driving, the work of moving cut trees from the forest to the mills downstream via river, was common and economically critical, but The Log Drive's Waltz is really a song about dancing, as a girl dreams to dancing with a lively and sure-footed log driver. And we all like to waltz with a log driver. 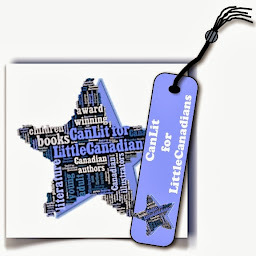 Reading The Log Driver's Waltz has me singing aloud a song that should be sung at campfires and school concerts to celebrate a Canada of our past. 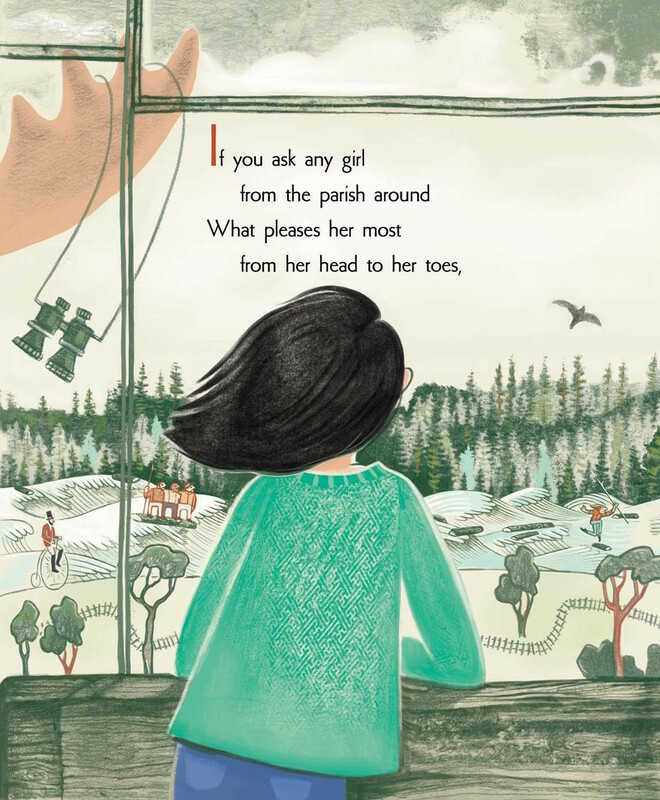 But it's Toronto artist Jennifer Phelan's updated artwork that brings the song and its story to the present, without making it a contemporary tale, which it is not. 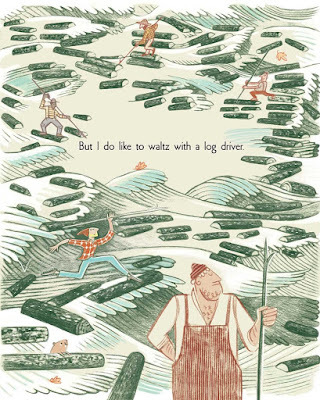 Log driving is very rare anywhere in the world now but Jennifer Phelan's illustrations seem almost timeless. 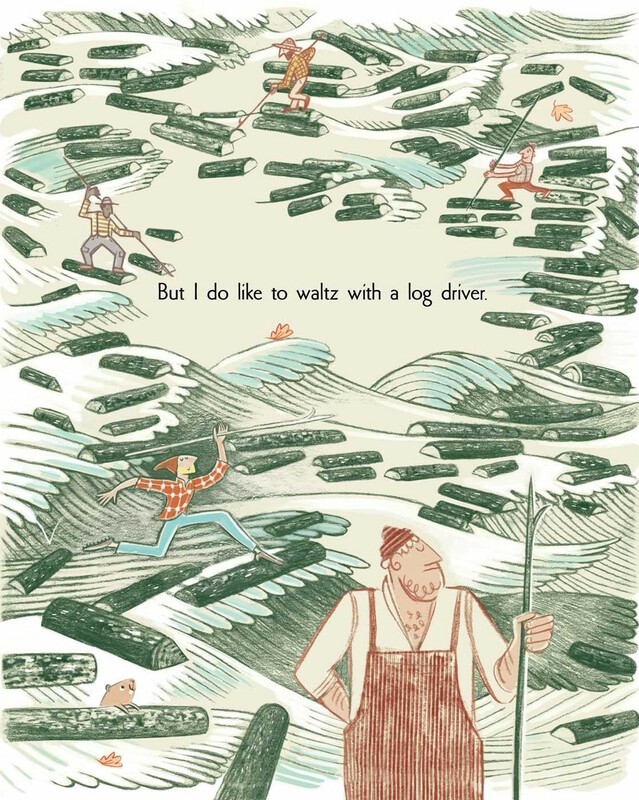 Though the log driver's appearance could be from the 1920s or the 2010s–a bearded fellow in a plaid shirt and toque–the dress of others reflects a variety of times. There are the long dresses of the 1900s or the flapper girl dresses and the spats of the 1920s and even top hats. In fact, our T-shirt-wearing girl puts on a simple frock and pumps that could be from anytime between 1920 and 2018. 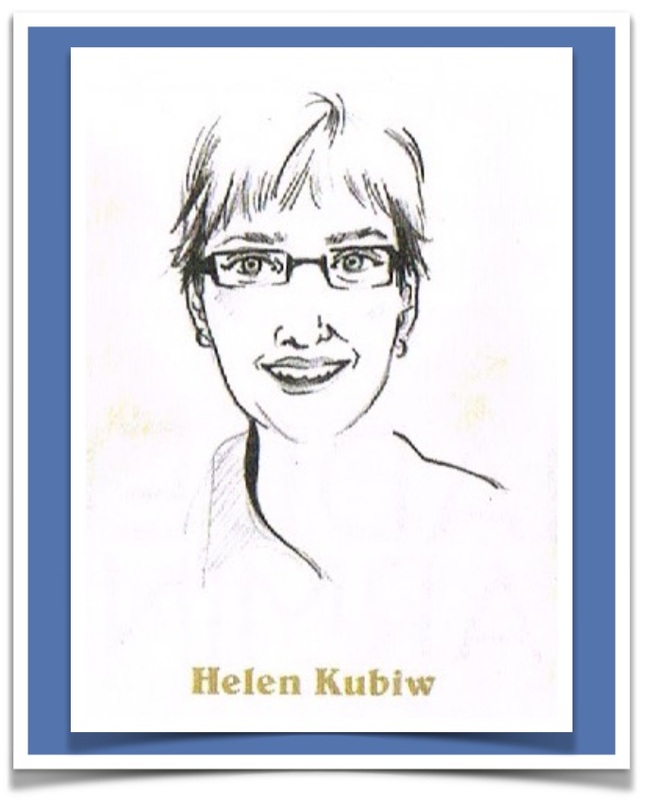 Moreover she honours those folk who brought history to life through music and art. In one image, the girl prepping for the dance is seen wearing a McGarrigle Sisters'1979 concert tour T-shirt. The flyer distributed to all announces the Weldon Waltz, recognizing the director of the NFB film. Even the endpapers show a darkened theatre with a small lit screen. And a stone statue outside the dance hall where the Weldon Waltz is held depicts the songwriter himself, Wade Hemsworth. 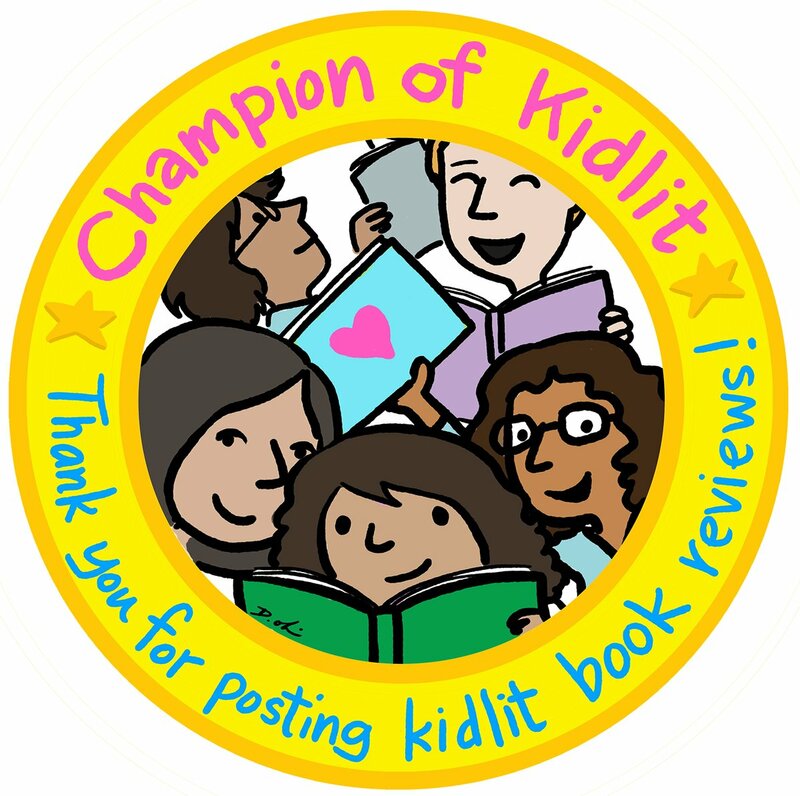 Moreover, this is a Canadian story, though log driving was done throughout the world. Here we see pine trees reflective of Group of Seven styles, beavers, moose and the folk art traditions of our country. 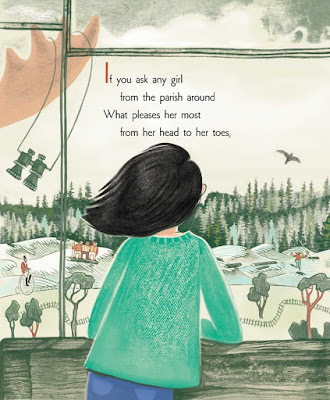 The Log Driver's Waltz is a celebration of music and art, retelling a story from the past and giving it new life in the present. And we're delighted to be reminded of those who go "birling down and down white water..." and renew the earworm experience of that vintage song.